Don’t let the word castles fool you. No, we are not in Scotland! Since the days of Ancient Rome, patrician families have frequented this region south of the city, dotted with castles that were once emperors’ homes. This tradition continues today as Romans still love to take refuge from the chaos of the city in Castelli Romani, where they appreciate the abundant vegetation, moderate climate and convenient location. During our driver-led Castelli Romani day trip you’ll learn the history and sample the cusine of the area. Castelli Romani is known for its cuisine and Frascati, a locally produced white wine. There is no better place to sip this wine while savoring the olives, cheeses and porchetta as well as an array of typical Roman dishes, than in one of the local “Fraschette” taverns – found only in this region. The Castelli are also known for the small towns nestling around its volcanic lakes. 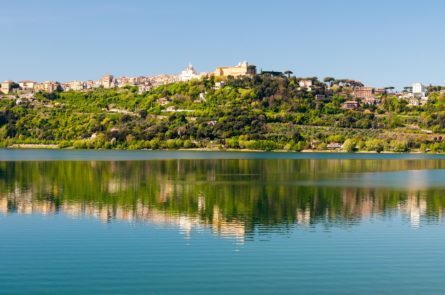 Castel Gandolfo, overlooking the Lake Albano, is where the Pope passes his summer vacation while the nearby Lake Nemi is famous for the strawberries that grow along its volcanic crater. Please note: the proposed itineraries are only examples of possible tours. For different pick up/drop off locations or customized itineraries we invite our clients to contact one of our tour coordinators to help them design their own tour. Taste your way through Rome’s best gelato shops with an expert guide and learn the history of gelato and its current trends during this Rome gelato tour. Taste a wide variety of frozen treats, including gelato, granita, and sorbet.